From Search Engine Optimization (S.E.O.) to Paid Campaigns (P.P.C. 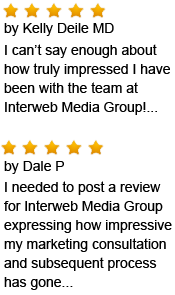 ), Interweb provides an online marketing solution that offers results. Our clients observe fast results by starting with a minimal initial investment, that incorporates a keyword industry analysis (K.W.A.) which is used in parallel with a monthly marketing management plan. We implement and include ad creation along with continuous monitoring of your selected advertising paid campaign, leading to a niche creation, consumer awareness, and results. Our S.E.O. services offer clients honest answers, informational feedback and efficient project management. Our vendor phased approach ensures timely client communication and realistic obtainable goals and expectations.